The Drawback: The place is small, so expect a wait; or on busy nights, reserve a table. The word “proper” might conjure thoughts of highfalutin etiquette befitting a Southern belle. Yet there are other ways to consider that word, one meaning “exactly correct,” which hits the nail on the head when referring to chef and owner Angela Kelly’s popular Southern restaurant, Proper. The Boone eatery isn’t serving anything fancy or offering trendy reimagined classics. Instead, Proper serves basic Southern staples using simple, fresh ingredients, and the outcome is, well, exactly correct. It’s as if a great chef and restaurateur got ahold of your Southern grandmother’s best recipes and added a dash of chipotle here and there, which is essentially Kelly’s formula for success, except the recipes are those of hers and her family’s. Opened in May 2010 in the town’s original 1896 brick jailhouse on Water Street, Proper is full of character and characters alike. The small eatery can seat a total of 72 people between the pretty shaded patio, glassed-in porch, and intimate dining room, where mismatch chairs and tables and soft lighting lend a cozy feel. On busy nights, waiters hustle through narrow aisles, delivering hearty plates of fried chicken, meatloaf, and more to a buzzing crowd of college students, visiting parents, postgrads, and business professionals. Smells of fresh biscuits and gravy, salty-sweet collards, and scrumptious desserts waft about, carrying an air of nostalgia for Southern kitchens of yore. “When I’ve come in here some days and it smells like my grandmother’s house, I feel like we’re doing something right,” says Kelly, who grew up in nearby Salisbury in a family that knew how to cook a proper meal and gathered often around the table. “That’s how I want people to feel when they walk in here, that they’re walking into a comfortable, safe place.” And given that Proper has become something of a community hub, where regulars come to sit, eat, relax, linger, and catch up, it’s safe to say Kelly has achieved that goal. 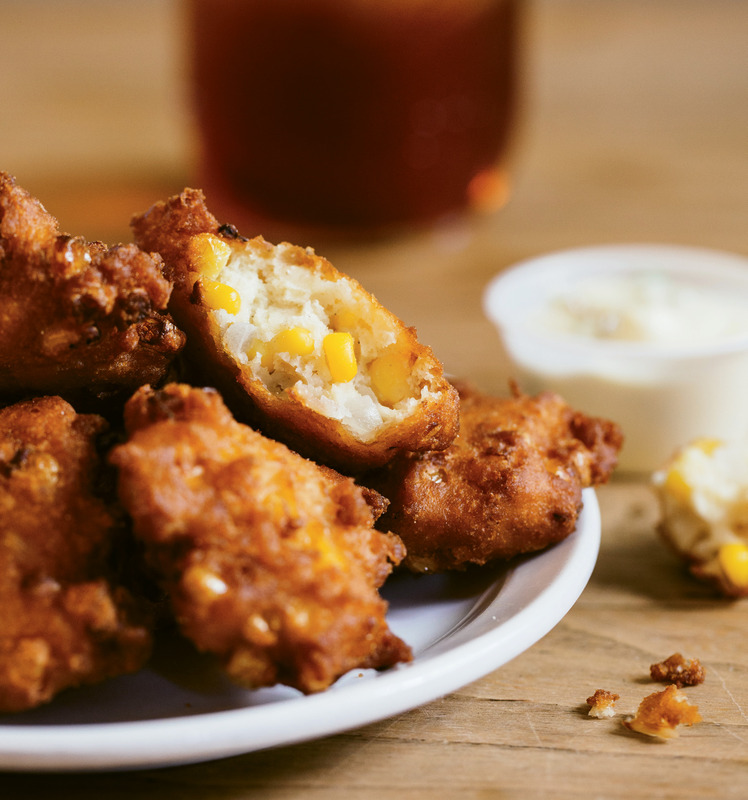 The menu is comprised of appetizers like hush puppies and corn fritters with jalapeño-lime aioli, salads, and a handful of sandwiches, including honey-chipotle pulled pork with Carolina slaw. The main attractions, however, are the meat-and-two platters, some of which rotate daily. Guests can choose between entrées like chicken and limas, tomato pie, or pulled pork (one of Kelly’s specialties), then pick from some 15 sides, from pickled beets and green beans to succotash and fried green tomatoes. Everything is made with minimal, all-natural ingredients and no preservatives, and is locally sourced and made in-house as much as possible. Even the condiments, save the mustard, are house-made. Eager to see if Proper could live up to its name, my husband and I visited on a packed Friday night. I was especially intent on trying the fried chicken to see if it could stand up to my great grandmother’s. At our server’s recommendation, we started with the delicately crispy catfish nuggets served with rémoulade before moving on to the mains. The fried chicken was perfect, even better than my great granny’s. Brined in buttermilk and dredged in seasoned breading, the boneless breasts were crisp on the outside and juicy on the inside. They had run out of the tomato pie, so we settled on the meatloaf for our other main, which was moist and not overly ketchupy. For the sides, we divided and conquered in an attempt to taste as much as possible. I’m more of a mayo slaw gal, but found Kelly’s vinegar-mayo combo well balanced between creamy and acidic. The salty-sweet collards with flecks of bacon were some of the best I’ve had, and the glazed carrots were just right—not overly buttered or sugared. The hot, gooey mac and cheese was the ultimate in Southern comfort. We also couldn’t resist trying the posole, a Mexican hominy soup not normally found on traditional Southern menus such as this. The dish once ran as a special but due to its popularity, Kelly gave it permanent placement on the menu. And of course no Southern meal is quite complete without a buttery biscuit or sweetened cornbread. We tried both, and like everything we tasted that evening, they were just right, or more fittingly, simply proper.